My cousin Maggie was diagnosed with cancer, alveolar rhabdomyosarcoma. She is twelve years old. I’ve never hated cancer, and I mean truly hated it in my guts, until I left the elevator, got within a few steps of CHaD, and really thought about why I was there yesterday. That’s when cancer stops becoming this token cause you see people rallying around, and it becomes extremely real. Her dad distracting himself through conversation with my grandfather in the corner. Her mother passing out in the chair by the bed, smashed with exhaustion. Mags will leave this place in a few days and will return once a week for over a year. If any of us could do it for her, we’d have already started. It’s a hell of a thing to put yourself in the shoes of another adult going through something like this, but a kid going through it seems so unrelatable. Because it’s so awful. Cancer is awful. It makes you angry that people don’t understand how awful it is. By virtue of this disease, Maggie and her family have been awarded a very unique perspective. I hope this affords her the wisdom to know what’s truly important in life well before most people figure it out. And I hope all of us better appreciate the fact that our idea of what is conventional and expected is truly not important; there is always a different path. Some paths are mundane, and this one will not be. May the only uneventful thing in the near future be her treatment. This is a time to be grateful for medicine. So sorry, Chris. 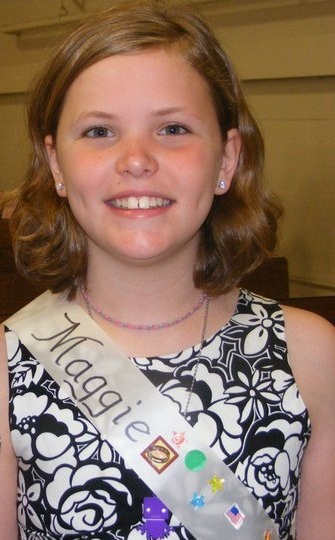 I will say a prayer for Maggie and her family.